SeaWorld Orlando is kicking off an “Epic Voyage” campaign to launch Antarctica: Empire of the Penguin, the park’s largest expansion, scheduled to open this spring. The campaign which stops in seven cities, also includes an all-new mobile app, both of which are designed to give families a sneak peek into the upcoming attraction. Antarctica: Empire of the Penguin will transport families into a rarely seen, icy world. Guests will be able to feel and see the South Pole through the eyes of penguins on a first-of-its-kind family ride. They will also be able to explore a massive penguin colony from above and below the penguins’ icy world. In select cities such as New York, Miami and Chicago, SeaWorld’s “Epic Voyage” will be taking over malls and travel shows with a unique interactive family experience. The event will feature a massive ice dome, interactive virtual reality, photo opportunities, chances to win prizes by playing Antarctica-themed games, and, of course, live penguins. Coca-Cola Freestyle machines will also be part of the experience on site offering complimentary, refreshing drinks. 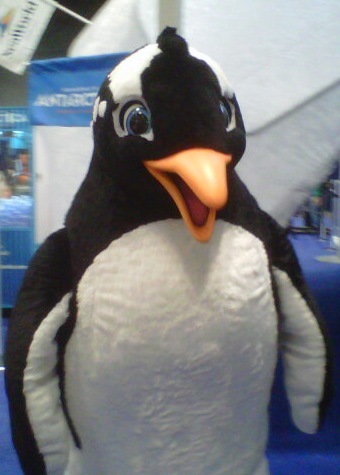 The tour also features a first look at Puck the penguin who will star in the attraction when it opens this spring. Check out a picture of Puck to the right, courtesy of @NerdYorkCity on Twitter. 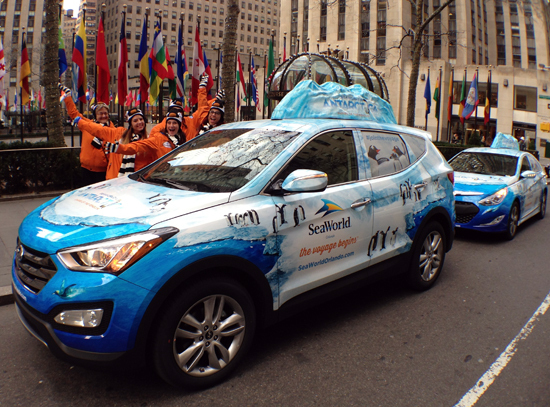 SeaWorld street teams will roam the cities in wrapped, Antarctic-themed hybrid vehicles as they meet with the locals at various hot spots, commuter stations and key landmarks. The street team will test locals with trivia, hand out prizes and allow them to visit Antarctica through the augmented reality videos. While the tour takes over a few key cities, an all-new mobile app allows fans the world over to put themselves in the action and share with friends. From behind-the-scenes teaser videos and tour details to penguin fun facts and trivia. The app — SeaWorld’s Antarctica — is available for download today on iPhone/iPad and is coming soon for Android devices. Click Here to see out a video we shot at SeaWorld using the app. Anyone can enter to win a trip to SeaWorld to experience Antarctica: Empire of the Penguin first hand in the Family Voyage Sweepstakes. Two families will receive a four-day, three-night journey to SeaWorld Orlando to be one of the first to experience Antarctica: Empire of the Penguin. This vacation for four includes roundtrip airfare, hotel accommodations, tickets to SeaWorld and Aquatica, Quick Queue passes, Antarctica gift bags and All-Day Dining at SeaWorld. Eighteen weekly first prize winners will receive four admissions to SeaWorld Orlando valid for use in 2013 as well. For more information about the Epic Voyage, visit SeaWorldOrlando.com/Antarctica.